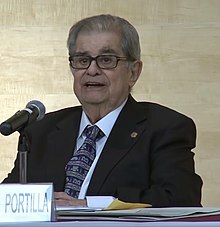 Miguel León-Portilla (born February 22, 1926) is a Mexican anthropologist and historian. He is the prime authority on Nahuatl thought and literature. He is thought to have helped revive the Nahuatl language through his books. León-Portilla was important in bringing to light the works of Fr. Bernardino de Sahagún, a 16th-century primary source on the Aztec civilization and whose works have become one of the major references for cultural and historical information on Postclassic central Mexico. On December 12, 2013, León-Portilla received the Living Legend Award from the U.S. Library of Congress. ↑ 1.0 1.1 "Miguel León-Portilla to Receive Living Legend Award at Celebration of Mexico, Dec. 12". US Library of Congress. November 20, 2013. ISSN 0731-3527. LOC-PR 13-206. Retrieved November 20, 2013. This page was last changed on 3 February 2018, at 16:46.